A corporate identity is crucial to get your company recognized. Creating a logo and carrying it through on all of your business stationery is the best way to accomplish that. We can help you with letterhead, envelopes and business cards that will create a professional look that will make your company proud. Searching for a new look? We can create an impressive identity package for you including new letterhead and envelopes. Or, if you’re pleased with your established design, we can print your letterhead and envelopes with the latest full-color technology. We design and print envelopes of all sizes and formats. 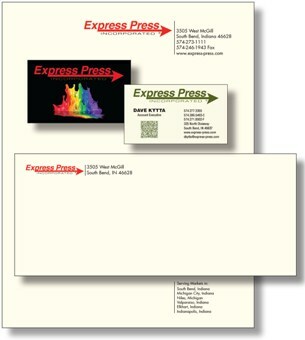 Your letterhead will be created to reflect your personal or corporate identity. You will have a wide selection from basic black and white to amazing color designs and a variety of paper stocks.